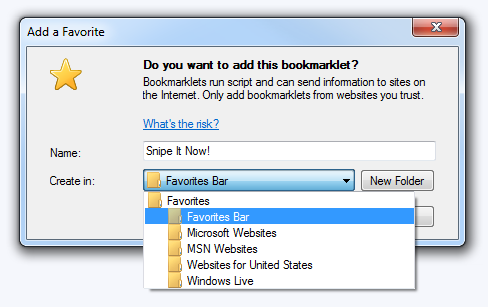 Use Snipe It Now to set snipes right from eBay! Drag and drop this link > Snipe It Now! < into your toolbar. Go to eBay and find an item you want to snipe. Click the Snipe It Now toolbar link, fill in your bid and Snipe It Now! The Snipe It Now window grabs the item number and item information for you; all you have to do is fill in your snipe preferences and set your snipe right there. If you are using IE or the drag and drop doesn't work, use the instructions below. Select "Add to favorites..." from the menu that appears after you right click. Tip: If a "Security Alert" window pops up click yes and proceed. Once the "Add a Favorite" dialog box appears, select the "Favorites Bar" folder from the list and click Add.